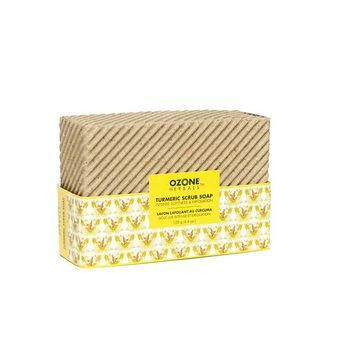 Ozone Herbals Turmeric Scrub Soap sloughs away dead skin cells, helps to clear blemishes, removes impurities, purifies the skin and improves its resilience. Oat and Wheat bran gently exfoliate dry flaky skin, while Turmeric extract delivers a wash that's known to soothe the skin and reduce early signs of aging. Its active ingredients with remarkable antioxidant properties and astringent action minimize pores and seal skin nourishment and moisture to revitalize and rejuvenate dull skin; leaving skin soft, clear, smooth and replenished.